Two posts in one day? What is this?! As we draw a close to the 15th raiding tier in WoW, I thought it would be a good time to post my thoughts and feelings of how I thought the tier went, as well as a few other things we’ve seen over the past few months. Starting the tier, I had to finish off my uni work, so I promoted Búllrog to raid leader for <Ex Cineribus> while I raided as a standard player and didn’t have to focus on knowing what everyone had to do and just focused on my own role. He did a stellar job, and we got to 2/13hc before I took the reigns for a short time and took us to 4/13hc before the raid team disbanded and we moved over to our new home in <OMFG Kittens>. Once there, we finished the raid tier on extremely high spirits and ended on a nice 10/13hc with plenty of time to have downtime before Siege of Orgrimmar! And I honestly can’t say I’ve been happier with my new home! Looking at the raid itself, and from my personal perspectives – Blizzard did a really, really good job with Throne of Thunder. It gave us the return of Jin’rokh and several important trolls in lore in Council of Elders. Of course, the final boss Lei Shen is also a recognisable character from the questing done in Pandaria. So while we had the majority of the raid of unknown/new faces, we can safely tick the box of having bosses in the raid of ones we actually know of before going in – a continuing trend in the next tier! The storyline for the raid worked really well too. We’re taking the fight to Lei Shen (though I’d prefer to have some Shado-pan accompany us for the first 3 bosses, or pile in after we kill bosses) until we get to the bridge between Council and Iron Qon, where we ended up getting the pathway crumble underneath our feet, to get fed to the beasts below the Throne. 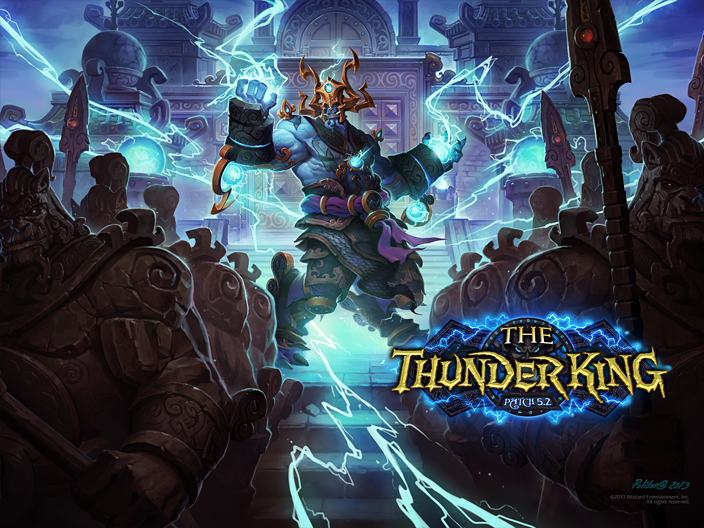 After fighting our way through the forgotten creations and beasts below the Isle of Thunder (along with a secret from years past) we finally come up against the tyrant mogu warlord and his most prized acquaintances. It is a fantastic story, the aesthetics look amazing, the fights are tuned very well on both 10 and 25 – with 10s actually having the prestige of difficulty this time around! But is it the Ulduar 2.0 we were led on to believe? Ulduar is still my favourite raid, though Throne of Thunder does come in at third on the list behind Karazhan – but the addition of LFR has somewhat deadened what would have been an awesome tier with being able to run the place multiple times (and getting angry at people for failing mechanics). Ulduar was great because it was so short a tier that you rarely ran more than once per week – you were left wanting more because ToC was released shortly after, that simply provided better gear. Ulduar was FILLED with Titan lore, again another item that leaves you wanting more. Ulduar also provided plenty of achievements that extended beyond hard mode, beyond the standard metas – it kept you coming back again for wanting more. Ulduar was a MASSIVE raid that had tons of potential, and no matter what it always gave people a reason to want to go back and experience it some more. Does ToT provide the same experience? Thanks to being in a much better guild than where I was back in Ulduar, the completionist side of me has been viably sated for this tier. Similar to Ulduar, the heroic-only encounter provides something that leaves you wanting more information about the Titans, but this time he’s a relatively simple fight in comparison to how Algalon was in comparison to Yogg-Saron (or so I’m led to believe). Is it the fact that I can run the place multiple times on multiple characters, and I’m just getting burnout from the raid? It certainly feels like I’ve been inside the halls of the Thunder King for many more hours than I was inside Yogg-Saron’s jail. Both the dailies of 5.2 and the weekly of 5.3 have been bearable, the Battlefield: Barrens even continuing my interest on some occasions after I’ve gotten everything I need achievement- or gear-wise from there. I still maintain the best daily hub for this expansion has been the Operation: Shieldwall and Dominance Offensive, with a questline intermittent between dailies at certain thresholds. Although I haven’t been to Krasarang since getting both of my gryphons, it was still an incredible questing experience, as far as WoW goes. While this hasn’t been a heavy PvP patch for me, it does need a slight mention. With the addition of Deepwind Gorge in 5.3, I have to say I’m surprised I have yet to be motivated enough to get that Gorgeous title. I haven’t really touched much arena since moving to Nagrand, though hopefully in 5.4 with cross-realm arenas, I’ll be able to team up with my old PvP buddies I left behind on Doomhammer. Valor points are staying – make sure to cap this week! Though there’s no new gear for valor, upgrades will be available straight away, and the current valor rewards are either changing to Justice rewards, or in the case of the Shado-pan Assault, being reduced by 34% in cost. Conquest points on the other hand will turn to Honor points. Extra honor over 4k will turn into gold. Once raiding Siege of Orgrimmar you will get ilvl 528 from LFR, 540 Flex, 553 Normal, 559 Warforged, 566 Heroic, and 572 Heroic Warforged. LFR requires iLvl 496 to enter, although the Timeless Isle brings us BoA 496 gear that will turn into an item suitable for that character’s loot spec. The raid unlock schedule can be found here. Crafters will want to hold onto or stockpile Bolts of Windwool Cloth, Magnificent Hide, Trillium Bars and Ghost Iron Bars to create the new 476 PvP gear, or used with 5.4’s Haunting Spirits (Spirits of War) to create 553 iLvl PvE items. 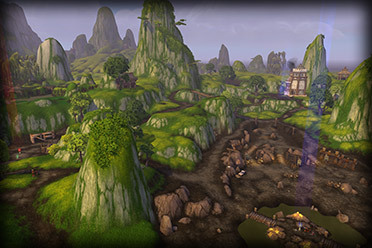 Scribes have new glyphs, and Engineers get a new mount, new pet, and more! So what did you guys think of the last tier? Did it live up to your standards? Did Blizzard bitterly disappoint you again? Are you looking forward to punching Garrosh in the face? I’ll see you later on this week after 5.4 has hit live servers!